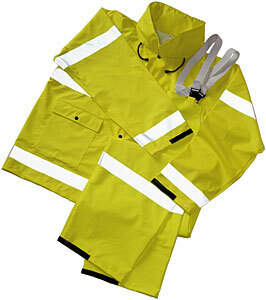 The affordable solution for high visibility rainwear that meets the new ANSI/ISEA 107-1999 standard. The affordable solution for high visibility rainwear that meets the new ANSI/ISEA 107-1999 standard. Tingley Rubber introduces the Comfort-Brite, Fluorescent Yellow-Green .35mm PVC on Polyester suit with 2 inch reflective tape. Loaded with features including zipper fly front, Velcro take-up straps, fall protection access, hood-in-collar, vented cape back and more, this durable suit is sure to provide the cost effective, quality you seek. Ideal for Construction, Transportation, DOT's, Municipalities, Meter Readers, Waste Management and General Industry.